Elaine Hancock (Olney, United States) on 4 June 2017 in Animal & Insect. Wonderful capture with superb colors . wow...lovely shot..food in it's beak..you caught it before it flew away ! This Gold finch are beautiful. 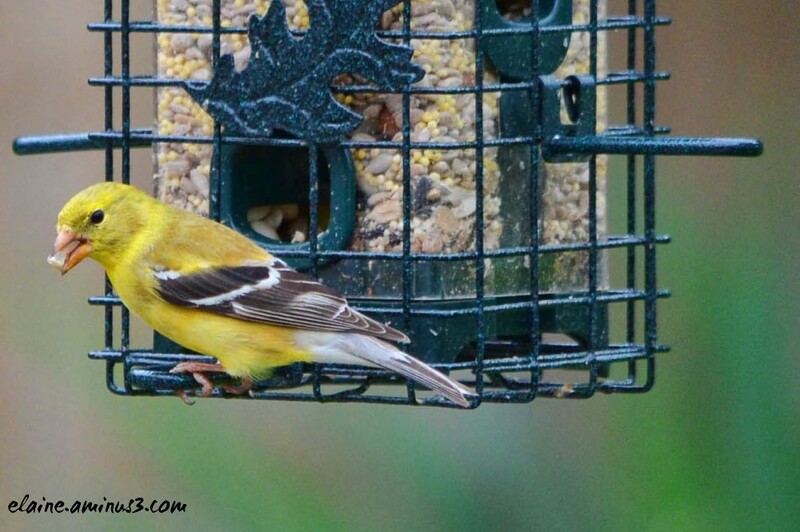 Until recently Gold finch were the only birds coming to my new feeder. Yesterday a Towhee stopped for a bite to eat. @Don: I have sparrows mostly, but also finches and cardinals. Plus an occasional blue bird, black Carolina chickadee and nuthatches. Lately a red winged black bird has been coming to the feeder. Beautiful! I love seeing the seed in his mouth! SUch bright yellow plumage! such beautiful composition, focus & colors! A lovely finch captured at an opportune moment. The completely unfocused background is a fine element.